[edyb] uses his relatively inexpensive Cannon camera quite a bit. However, in dark areas or extreme closeups, the camera’s image quality leaves something to be desired. [edyb] hopped on the ‘net and found out that a ring light may cure his photo faux pas. Ring lights are nothing new but nothing existed for his lower-end point and shoot camera. With a USB-powered lamp and a spare AA battery pack kicking around, [edyb] decided to make his own. First, the USB lamp was disassembled, luckily the LEDs were already laid out in a ring shape. The clear protective housing and gooseneck were discarded and the remaining PCB ring was glued directly to the camera. A female USB jack was then glued to the top of the camera and soldered to the two leads connected to the lamp’s PCB. The AA battery holder received a small switch and a male USB plug, also courtesy of a few dabs of glue. The now-assembled battery pack plugs directly into the camera via the USB connector and is its only method of attachment. The utilitarian modification may look crude but the results are anything but. Check out this close-up macro shot of a Canadian penny. Not too bad. After several months of work, [Greg] has completed one of the most polished LED clocks we’ve ever seen. It’s based on the WS2812 RGB LEDs, with an interesting PCB that allowed [Greg] to make a huge board without spending a lot of money. The board is made of five interlocking segments, held together with the connections for power and data. Four of these boards contain only LEDs, but the fifth controller board is loaded up with an MSP430 microcontroller, a few capsense pads for a 1-D touch controller, and programming headers. Finishing up the soldering, [Greg] had a beautiful LED ring light capable of being programmed as a clock, but no enclosure. A normal plastic case simply wouldn’t do, so [Greg] decided to try something he’d never done before: casting the PCB inside a block of resin. A circular mold was made out of a piece of MDF and a router, and after some problems with clear resin that just wouldn’t cure, his ring light was embedded in a hard, transparent enclosure. Conveniently stuck in the mold, of course. The MDF had absorbed a little bit of the resin, forcing [Greg] to mill the resin ring free from the wood, with a lot of finish sanding to make the clock pretty. It’s a clock that demonstrates [Greg]’s copious manufacturing skills, and also his ability to troubleshoot the problems that arose. While he probably won’t be casting things inside an MDF mold anymore, with the right tools [Greg] could easily scale this up for some small-scale manufacturing. We’re not blatantly trying to promo this product. It’s just that the build log covering a ShapeOko assembly process taken on by [Anool] is like crack for those of us who have yet to acquire our own desktop CNC mills. Like the title says, this thing is basically a mill in a box. But [Anool] decided to order the version of the kit that doesn’t come with any motors or control electronics. He also planned for future upgrades by ordering additional extruded rail to increase the size of the ShapeOko. After assembling the frame his decision to source stepper motors locally bit him as they were out of stock. But there was still plenty to do preparing control electronics during the wait. He based his system on a Raspberry Pi which talks to an Arduino to address the motors and monitor the sensors. Once all the parts were finally accounted for he tested the rig as a pen plotter. The pen was eventually replaced with the router motor and that ring light PCB seen above was the first thing he milled with it. DIY ring light setups for DSLR cameras are nothing new around here. While most of them rely on an array of LEDs or a mirror-based light tube, [Wolf] had a different idea. He figured that since optical fibers are made specifically for transmitting light from one place to another, they would make a perfect medium for constructing a ring light. Since he was using the camera’s built-in flash to power the ring light, he was able to provide a function that few other DIY ring lights do: proper flash compensation. Typically, a self-made ring light flashes at one set brightness, regardless of how much light is actually required to compose the image. The construction was relatively simple, albeit time consuming. He procured a set of fiber optic cables that had been melted together into 150 small bundles, which he then glued to an acrylic ring that he fabricated. The end result isn’t the most aesthetically pleasing ring light we’ve ever seen, but it’s the pictures that matter at the end of the day. As you can see on his site, they speak for themselves. Looking to build your own ring light? Check out a couple of other projects we have featured in the past. [Jani] built his own photography ring light based on automotive LED rings. The rings he used are meant to encircle headlights on a car and are available at a low cost. The assembly is built around a filter that attaches to his camera lens. Two rings of LEDs are then glued to a case made from the plastic of a CD-R container. To diffuse the light, he sanded both sides of the clear plastic housing to make it translucent. LED rings operate on DC power and unlike a ring flash, they provide constant light to help set up your shot. His finished project is well-built and should come in between $10-20. For those who enjoy photography, a ring light is a nice tool to have. Being hackers, making your own seems only logical. This writeup will take you through the process of making one from fiber optics for super cheap. 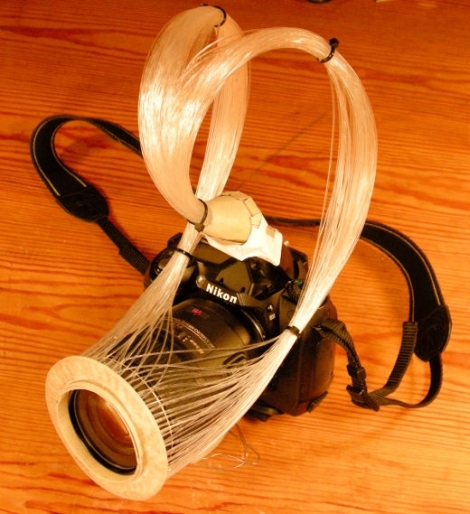 They basically gutted some fiber optic toys and strapped them to the lens. Sure there was a little more work involved, but that’s the gist of it. You may recall some more in depth fiber optic ring lights using LEDs or cold cathodes that we covered before.